My oldest, Eloise, was interested only in cars, frogs and the Backyardigans for the first three years of her life, but after turning three, she caught that dreaded princess bug. I assure myself that she’s not one of those girls. You know, the girls whose only concern is looking pretty, girls who think that becoming a princess is a possible reality, girls about whom books like “Cinderella Ate My Daughter” are written. Admittedly, Eloise would wear a crown, princess dress and high heels every day, all day if I let her. But while wearing her fancy get-up, Eloise doesn’t act like a princess; you’re more likely to find her crouched and ribbiting like her favorite amphibian. So, I suppose I’m willing to support her interest in princess stories, although I favor a less pink and Disney-branded version of these tales, something with its foundation in the centuries-old folk traditions from which the animated versions of Cinderella, Snow White and Ariel sprang. I found just such a book while on vacation. With my children entertained at an outdoor book fair with their dad, I was afforded the rare luxury of spending as long as I liked in the children’s section of an actual bricks-and-mortar bookstore without the threat of displays being overturned and whole shelves emptied of their contents. 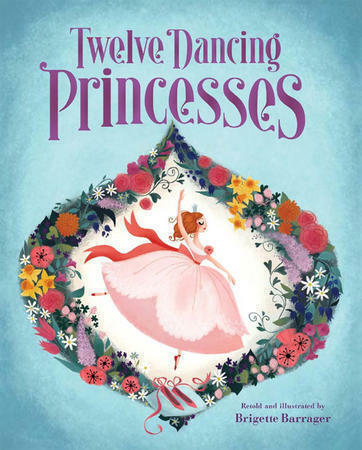 When I caught sight of Brigette Barrager’s “12 Dancing Princesses,” it was one of those blissful “find” moments I’m always hoping for. 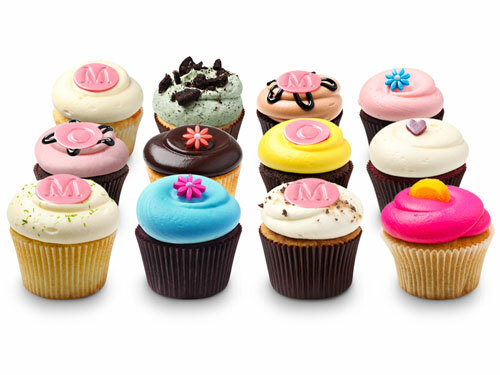 The cover art and ensuing illustrations are a visual indulgence equivalent to eating one of the DC Cupcakes girls’ famous frosted and sprinkled delicacies. However, the title is what really grabbed me. 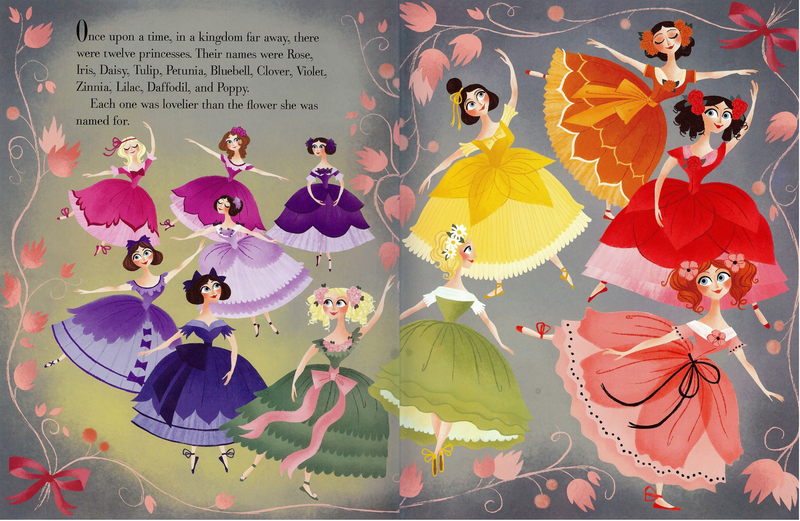 This wasn’t just a princess book but a book about a dozen princesses, and a dozen princesses who dance, for that matter. Eloise would be thrilled! As I opened the front cover, my inner skeptic dreaded finding of a story better suited for a Barbie coloring book. Much to my delight, I discovered a wonderful retelling of a Grimm’s fairy tale that had long ago captivated me but had been buried in my memory for more than 20 years. 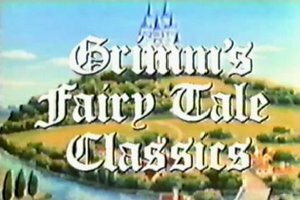 If you were a child of the ’80’s and watched as much Nickelodeon as my three sisters and I did, you may recall “Grimm’s Fairy Tale Classics,” a Japanese-anime interpretation of the Brothers Grimm stories and other folk tales. This clip of the opening theme song on YouTube might jog your memory; I found myself immediately singing along. Also known by the title, “The Twelve Dancing Princesses,” “The Worn-Out Dancing Shoes” was first published by the Brothers Grimm in 1812. It is the story of a king’s 12 daughters who, despite being locked in their room each night, are discovered every morning with their shoes worn through as if they had been dancing all night. Barrager has taken liberties in her interpretation to transform some of the darker elements of the Grimms’ tale, whose original stories were intended for an adult audience. In softening its edges, she has preserved the essence of the story while making it more attractive and appropriate for her younger readers. For the tiara obsessed, Barrager has given her princesses more endearing personalities, naming each after a beautiful flower and modeling their apparel after their namesakes. My daughters insist that I identify each of these blooming beauties, although I tend to get a little lost when it gets down to Tulip, Petunia, Bluebell and Iris. Barrage also has cultivated a more endearing hero for her princesses in the form of Pip, the king’s in-house cobbler. 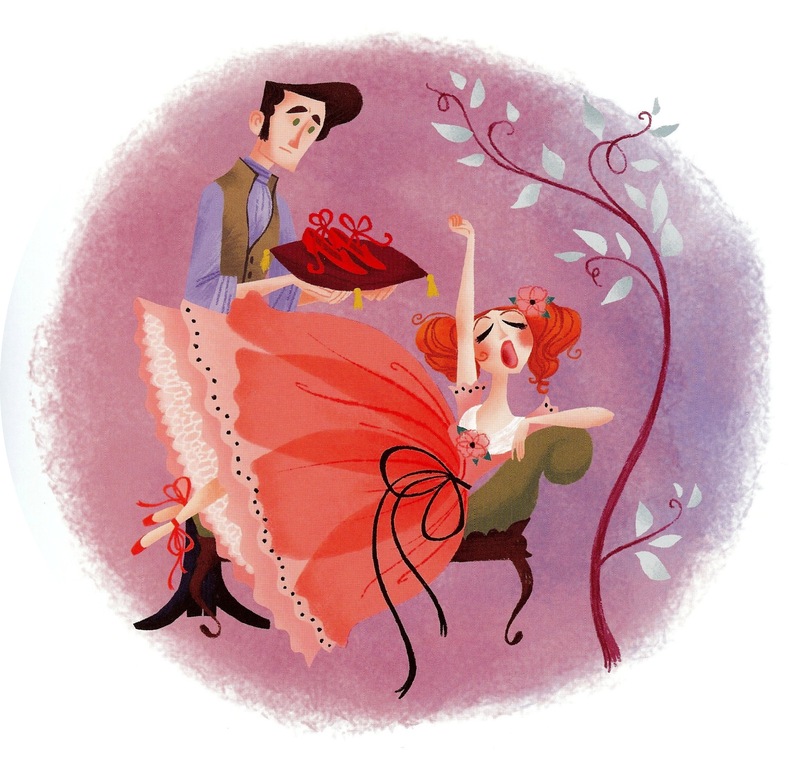 Pip is responsible for repairing the princesses’ shoes each morning, and it’s revealed he has a special affection for the youngest princess, Poppy. In the Grimms’ original version of the story, it is an aged soldier who finally solves the mystery of the princesses’ nightly activities. The solider is tipped off by a woodland witch, who reveals that the princesses drug the men who attempt to investigate their nocturnal secrets. Armed with that knowledge and the witch’s invisibility cloak, the solider feigns sleep and observes the princesses escaping their room through a staircase leading to unknown depths beneath the castle. Pip, however, relies on his own ingenuity and innate skill to solve the mystery at hand. 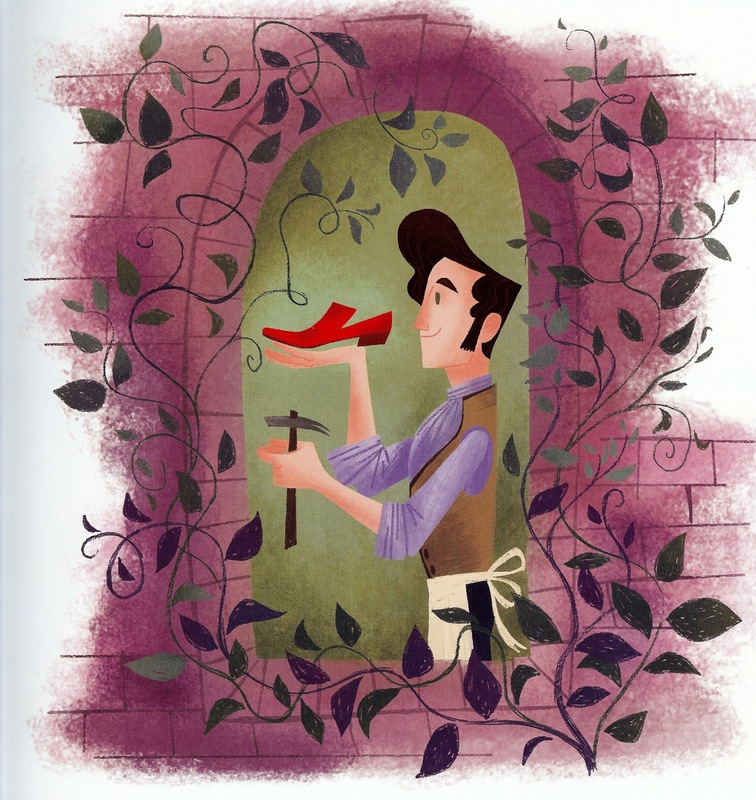 He crafts himself a pair of the softest, most silent shoes possible and observes the princesses stirring after the rest of the castle has gone to bed. Dressed in their finest gowns, but with their eyes closed as though they are sleepwalking, the princesses descend the stairs hidden beneath their bedroom floor. 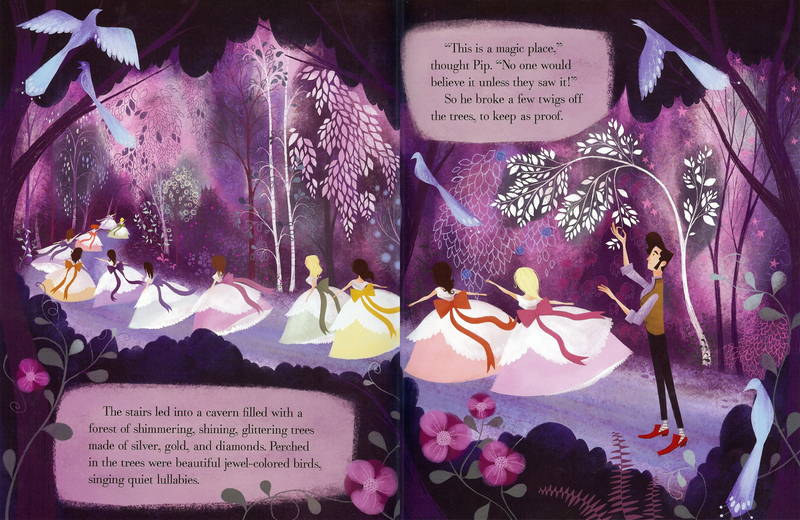 Pip follows unheard and discovers the enchanted world into which the princesses are drawn each evening. Here Barrager wonderfully captures the exquisite details that so enthralled me as a child: a forest of trees encrusted with silver, gold and diamonds, upon whose branches jewel-colored birds perch. Pip removes a branch from each of these uniquely gilded trees as evidence of what he’s seen before following the princesses as they cross a dark and dreamy lake to an island hosting a magical ballroom. There, the princesses dance until morning, then they depart the island as mysteriously as they arrived. Determined to break the enchantment that holds the princesses captive each night, Pip turns to the age-old solution of fairy tales: a kiss. He bestows one on Poppy’s hand, and the princesses’ eyes instantly flutter open. The forest around them begins to crumble to vapor and dust and they hurriedly escape through the trap door, which also disappears in a whirl of smoke. Pip and the princesses rush to the king and share their fantastic story, presenting the jeweled branches as evidence. 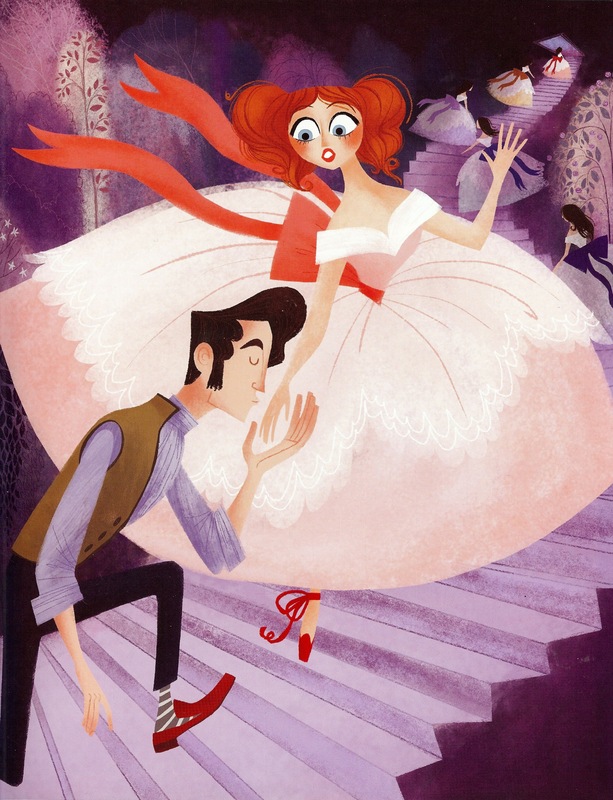 The king offers Pip any reward he desires – gold, diamonds, a castle – but Pip nervously requests permission to ask for Poppy’s hand in marriage. Poppy enthusiastically responds “yes” on her own behalf, they marry and, of course, live happily ever after. Barrager’s treatment of this fairy tale is so wonderfully perfect, I would love to see her produce subsequent editions of other seldom-published folk stories. The Princess and the Pea, another of my personal favorites, would fair wonderfully in her hands. In the meantime, Barrager has created a digital story, available through the Jib Jab Jr. iPad app, that’s bound to fulfill any little girl’s princess fantasies. 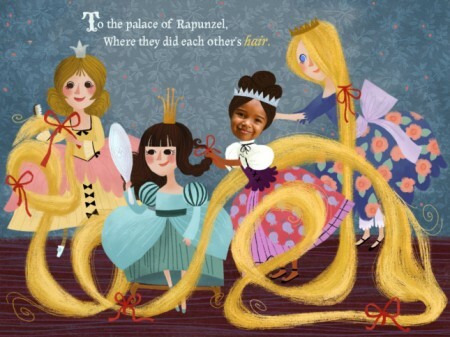 “A Perfect Princess Day” makes your child the star of a story also featuring some of her favorite fairy tale heroines: Snow White, Rapunzel, Sleeping Beauty and Cinderella. You simply upload a picture of your own darling princess and her face is inserted into the story. Just like that, she’s off having tea parties and attending balls at the castle with her royal friends and a magic flying pony.